Kauai offers excellent scuba diving year-round, and we are conveniently located almost directly across the road from Koloa Landing, one of Kauai’s most popular shore dive locations. 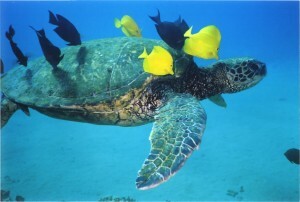 We also offer easy access to Kauai’s best dive shops, tours, and packages. 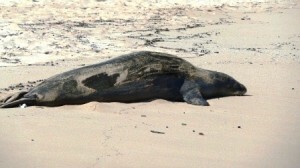 We are divers, and we specialize in creating Kauai dive packages that make the best of Kauai diving easy & affordable. We are happy to arrange scuba diving trips of any kind, including boat dives to nearby Ni’ihau (the “Forbidden Island”), which many consider one of the best and most exciting dives in all of Hawaii. 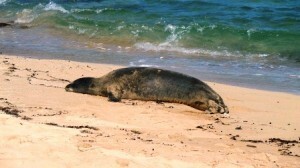 We can even provide resort dives for non-certified divers, or any other type of dive that is available on Kauai. SPECIAL: Hawaii Wedding Packages Starting at $1,500.00! Let us help you make your Hawaii Wedding the event of your lifetime! Best of all, you don’t have to spend a fortune for your wedding in paradise. Weddings can be performed on your choice of some of Hawaii’s most romantic and breathtaking beaches, right here on our property, or at the venue of your choice. We specialize in small, intimate weddings with true aloha, whether you prefer a private wedding with only the bride and groom in attendance or you wish to have a small wedding party. Let us take care of everything for you, and make your wedding a tropical dream come true! 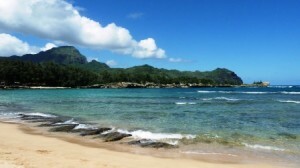 Whether you’re looking for the perfect place to swim, snorkel, sunbathe, surf, bodyboard, or just get away from it all, Kauai has just the beach you’re looking for. 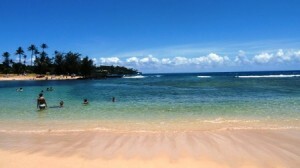 The Kauai Beach Inn is just a short walk from some of Kauai’s best beaches, including Poipu Beach, and we are centrally located so that you’ll have access to the beach of your choice. 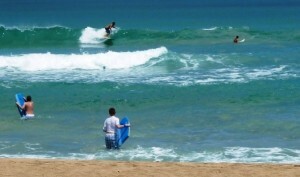 So whether you crave the isolation of Polihale Beach (photo above) or the ideal surfing conditions of Hanalei Beach, the Kauai Beach Inn provides the perfect home base from which to explore all of Kauai’s magnificent beaches. 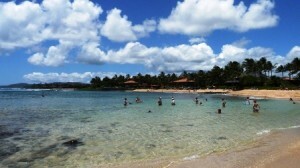 Poipu Beach, considered one of America's best beaches, offers everything from surfing to snorkeling all in one location! 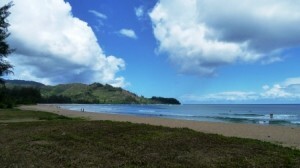 In addition to some of the finest surfing in Hawaii, Hanalei Beach is a great place to hangout and enjoy the scenery. 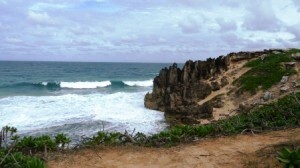 One of the amazing things about Kauai is the wide variety of beaches that are found here. 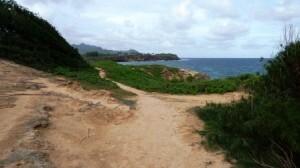 This is part of the trail to Maha'ulepu Beach, which can only be reached via a bumpy 2-mile (3.2 km) dirt road or an oceanside trail. There are so many beaches and so many different types of beaches…and waterfalls…and spectacular views here on Kauai that it can be difficult to decide which ones to visit. Fortunately we can help you resolve this dilemma. 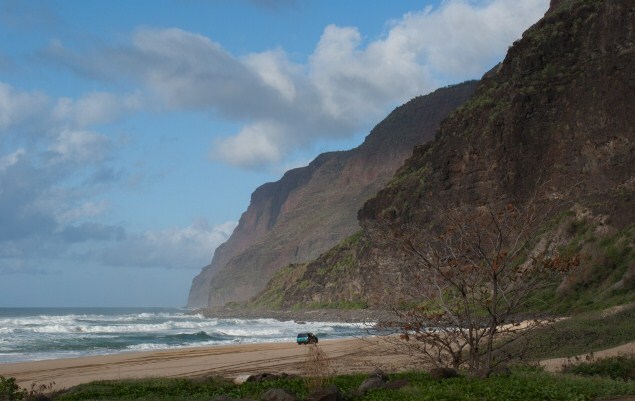 And with many of Kauai’s attractions, selecting a destination is only half the challenge—after all, on an island where paved roads can only take you to a tiny percentage of what there is to see, you still need to figure out how to get there! We can help you with that too. 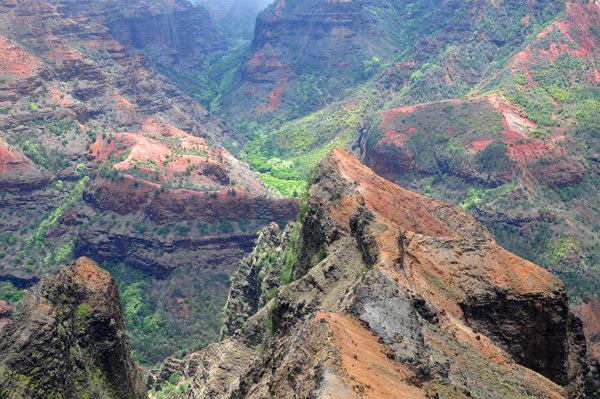 So whether you want a lot of guidance or prefer to explore the island on your own, we can help you find exactly the Kauai you came here to discover. 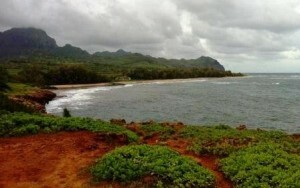 For more about Kauai beaches, please visit our Kauai Beaches page.